WASHINGTON, March 21 (Yonhap) -- A U.S. House subcommittee chairman on Tuesday urged President Donald Trump to impose "secondary sanctions" on Chinese firms doing business with North Korea, saying Beijing will help rein in Pyongyang only when its interests are threatened. "The administration must also start using its secondary sanctions authority against Chinese entities that have allowed for North Korea's continued weapons development. China accounts for 90 percent of North Korea's economic activity," said Rep. Ted Yoho (R-FL), chairman of the House Foreign Affairs Subcommittee on Asia and the Pacific, during a hearing. "It's time to stop pretending that China's North Korea policy is motivated by anything other than extreme self-interest. China has benefitted from undermining sanctions and tolerating North Korea's nuclear belligerence. North Korea's missiles are not aimed at China, and the growing security challenge is an excellent distraction from China's own illicit activities," he said. Yoho also denounced as "unacceptable" China's retaliation against South Korea for hosting of the U.S. THAAD missile defense system, saying the system is solely oriented towards South Korea's defense and China should "address the threat that makes it necessary." China has taken a number of economic retaliatory measures against South Korea, including restrictions on South Korean imports and a ban on Chinese tourists from visiting the neighboring nation, as Seoul refused to give in Chinese pressure to scrap the decision to host THAAD. Experts who appeared at the hearing also called in unison for massive pressure on China. 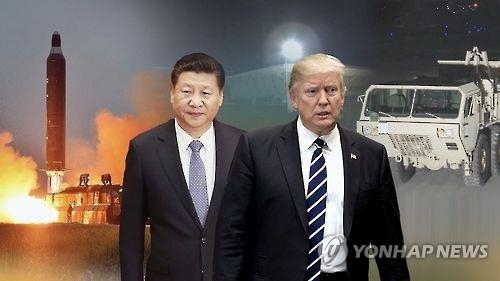 "China's strategic interests in the Korean peninsula will shift toward pressuring the Kim Jong-un regime to the point of destabilizing it only when China itself is confronted with a serious and imminent security, economic, or humanitarian threat," said Lee Sung-yoon, a professor at Tufts University's Fletcher School of Law and Diplomacy. "Raising the financial cost of coddling Pyongyang for China is firmly within the U.S. diplomatic arsenal and legal authority," Lee said. Lee stressed that China sees no reason to alter the status quo at a time when a nuclear Pyongyang enables it to use the "North Korea card" against the U.S. That's why the U.S. should make the status quo a higher risk for China, the expert said. "Under the current dynamics in the region, China will remain more an obstacle than key to North Korea's denuclearization. The road to North Korea's denuclearization indeed lies through China, but only through a China incentivized by economic disincentives to change course and, out of pragmatic considerations, apply, even if begrudgingly, increasing pressure on Pyongyang's international finances," he said. That's in line with the point U.S. President Donald Trump has long made. The Trump administration has made it a key priority to get China to exercise more leverage as the main energy and food provider for North Korea to rein in the provocative regime. Trump has long said that North Korea is China's problem to fix. China is North Korea's last-remaining major ally and a key provider of food and fuel supplies. But it has been reluctant to use its influence over Pyongyang for fears that pushing the regime too hard could result in instability in the North and hurt Chinese national interests. Beijing has often increased pressure on the North in the past, especially when Pyongyang defied international appeals and carried out nuclear and missile tests and other provocative acts, but it never went as far as to cause real pain to the North. Anthony Ruggiero, senior fellow at the Foundation for Defense of Democracies, also called for pressure on China. "While China is critical to any effort to increase sanctions on North Korea, America has in the past sought Beijing's cooperation at the U.N. -- a strategy that failed completely," he said. "If Washington wants to be serous about sanctions, it must acknowledge that China is part of the North Korea problem until Beijing demonstrates otherwise." Bruce Klingner, a senior fellow at the Heritage Foundation, said that the U.S. can influence the behavior of Chinese banks and businesses that engage with North Korea through the use of "targeted financial measures." "U.S. officials indicate that the Bank of China defied the government of China in severing its ties with North Korea lest the bank face U.S. sanctions itself. The action showed that U.S. government actions can persuade Chinese financial entities to act in their self-interest even against the wishes of the Chinese government," he said. He called for the U.S. to use the North Korea Sanctions and Policy Enhancement Act, which was enacted last year, to impose secondary sanctions Chinese banks and companies that violate U.N. sanctions and U.S. law. "The U.S. should penalize entities, particularly Chinese financial institutions and businesses, that trade with those on the sanctions list or export prohibited items. The U.S. should also ban financial institutions that conduct business with North Korean violators from access to the U.S. financial network," he said.